Kelowna First Aid is the largest provider of St Mark James CPR certification programs in the Okanagan area. This provider offers a number of courses as it serves the Okanagan Valley including Kamloops, Penticton and East / West Kelowna. The main training centre is located in Downtown Kelowna along Harvey. Popular courses offered by this workplace approved provider include standard, childcare and occupational first aid. 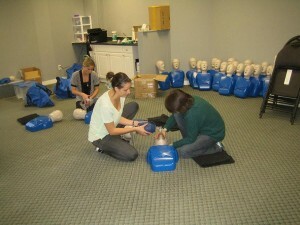 This provider is most known for the high volume and large selection of CPR courses. Customers can register for CPR level’s ‘A’, ‘C’ or ‘HCP’. Basic and advanced life support programs are also available. Course prices are the lowest in the region and certification provided to successful participants is valid for 3 years. Just visit the Kelowna First Aid website linked below for a complete list of classes and an on-line registration form. Likewise, trainees are also encouraged to complete their enrolment via e-mail, telephone call, or walk-in during business hours in any of Kelowna First Aid’s training centres. You can contact this St Mark James training provider with the information below. What CPR classes are Available? Re-certification classes are also available for CPR level “C” and “HCP”. Participants looking to renew other CPR classes must re-take the original course. What First Aid Classes are Available? The following first aid programs are available with Kelowna First Aid. All first aid classes include CPR and AED certification. To register for any of the above mentioned courses use the contact information posted above. St Mark James training certificates are given after a trainee has finished the enrolled course. It is valid for three years throughout Canada and can be recertified through refresher programs held on weekdays and on weekends. How much is are the training fees? Course rates at Kelowna First Aid are the cheapest in the area. Enrolment fees include taxes, certification fees, and training manuals. Trainees don’t have to pay any additional fees during training. Should a trainee be unable to complete a training course, he or she is entitled to a full refund provided a 72-hour notice was done prior to dropping out. Training manuals and use of training equipment are already included in the initial enrolment fees. The training centres are complete with everything you need for training such as high end equipment and well-stocked first aid training kits. The centres are also within walking distance to amenities such as free parking, restaurants, and shops. Loss of consciousness – or the layman’s term fainting – happens when there is poor blood and oxygen delivery to the brain, causing it to temporarily shut down. This can be due to a fall, head trauma, or even drastic changes in temperature. Fainting can be one-time thing or could be a sign of an underlying medical condition. If you notice that your fainting spells occur often or in response to a particular activity, be sure to discuss it with your doctor. Learn more about loss of consciousness and other injuries with Canadian CPR training.